HDFC Life Click 2 Protect 3D Plus is a online term insurance plan that offers comprehensive security at an affordable price. 3D stands for the three uncertainties that we face at some point in time, i.e. Death, Disability and Disease. With this online term policy, ensure that your family is safeguarded financially if an unexpected eventuality occurs. 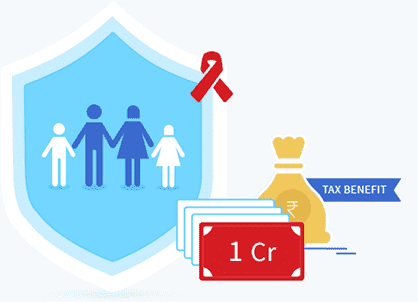 HDFC Life Click 2 Protect 3D Plus offers a wide range of 9 plan options to help one choose as per their need. *Only available for regular premium and limited premium policies. Single premium policies can avail a discount of 2% on online purchase. Why you need this Plan ? This online term plan is designed to pay out the entire sum assured as lump-sum on death of the policy holder or on diagnosis of Terminal Illness. Also, all future premiums are waived upon Total Permanent Disability due to an accident. Accidents are unanticipated realities which demands preparedness. Hence, we offer you the Extra Life option in which, in addition to the life option benefits, your nominee will receive an additional sum assured in event of death due to an accident. It provides lump-sum benefit on death or diagnosis of Terminal Illness similar to Life option. Additionally, you will receive waiver of future premiums not only on total permanent accidental disability but also on diagnosis of any of the 34 covered Critical Illness. As the name suggests, this option protects you for entire life.You pay premiums only till the age of 75 but stay covered for whole life. The entire sum assured is paid as lumpsum in case of death or diagnosis of Terminal Illness and all future premiums are waived off in case of total permanent Accidental Disability. In addition to the benefits under Life Long Protection Option, you will also receive waiver of future premiums upon diagnosis of any of the 34 covered Critical Illness. You pay premiums only till the age of 65 but stay covered for whole life. Under this plan option, your total premiums 22 will be returned if the policyholder survives till the end of the Policy Term. On death/ diagnosis of Terminal Illness during the Policy Term a Lumpsum benefit will be paid to the nominee and all future premiums are waived off in case of total permanent accidental disability. In this option, you can choose the term for the monthly income to be received by your nominee to ensure continuous financial stability of the family. You can have either level or increasing monthly income depending on your requirement. Along with this, a lump-sum benefit on death or diagnosis of Terminal Illness is paid and all future premiums are waived off in case of total permanent accidental disability. An extension to the income option, benefits include an additional Sum assured paid out on accidental death partly as Lumpsum and partly as income. This plan option ensures that the nominee keeps receiving the income stream even in one’s absence. In case of death or diagnosis of Terminal Illness, the nominee will receive 12 times the applicable monthly income as lumpsum as well as a level/increasing income for residual policy term. Apart from this, all future premiums are waived off in case of total permanent accidental disability. Annualised premium shall be the premium payable in a year chosen by the policyholder, excluding the underwriting extra premiums, loadings for modal premiums, service tax and cess, if any. This option is available for all plan options and is subject to BAUP. For complete details on terms and conditions for the above given benefits, kindly refer the product brochure. This option is available for all plan options has to be opted for at policy inception and is subject to BAUP. For Income and Extra Life Income options, the minimum income term shall be 1 month and the maximum income term will be 20 years. What are the plan options available for this product? Life Option: This is the standard option, which gives your family the assured sum as a lumpsum in event of death or on diagnosis of terminal illness. You will receive waiver on future premiums in case of permanent disability due to an accident. 3D Life Option: You will receive waiver of premium on detection of 34 critical illness. Extra Life Option: Option that gives your family additional lumpsum amount due to an unexpected accidental death of the life assured. This needs to be selected at the time of policy inception. Return of Premium Option: This is only plan option in this product with survival benefit. All the premiums paid (less applicable taxes) will be returned if the policyholder survives till the end of the policy term. Life Long Protection Option: Along with the benefits under the Life option, the policy cover is for the life assured™s entire lifetime. 3D Life Long Protection Option: Option that gives you waiver of premium in case detection of 34 critical illnesses along with the benefits under Life Long Protection option. Extra Life Income Option: An extension to the income option, benefits include lump-sum payout in case of death due to accident & regular monthly income (level or increasing) chosen at the time of inception. Income Replacement Option: In case of death or diagnosis of Terminal Illness, the nominee will receive 12 times the chosen monthly income as lumpsum as well as a level/increasing monthly income for residual policy term. What are the conditions under the Terminal illness? Under all the plan options, the policy holder receives lumpsum payout on diagnosis of terminal illness. A Medical Practitioner is a person who holds a valid registration from the Medical Council of any State or Medical Council of Indian or Council for Indian Medicine or for Homeopathy set up by the Government of India or a State Government and is thereby entitled to practice medicine within its jurisdiction; and is acting within the scope and jurisdiction of licence. The person must be qualified in allopathic system of medicine and shall not be the Life Assured himself/herself. What is the definition of permanent accidental disability? Under all the plan options, the policy holder receives waiver of premium in case of permanent disability due to an accident. Disability as a result of injury or accident and is thereby rendered totally incapable of being engaged in any work or any occupation or employment for any compensation, remuneration or profit and he/she is unlikely to ever be able to do so. The total and irrecoverable loss of sight of one eye and loss by severance of one limb at or above wrist or ankle. How is the benefit of lumpsum payout on accidental death defined? In addition to the sum insured on death, the nominee will receive the additional sum assured chosen at the time of inception in case of death due to accident. This benefit is available under the Extra Life option and the Extra Life Income option. Please note that accident is a sudden, unforeseen and involuntary event caused by external, visible and violent means. Accidental Death means death by or due to a bodily injury caused by an Accident, independent of all other causes of death. Accidental Death must be caused within 180 days of any bodily injury. What period will I be covered for? You can choose to be covered for any term from 5 years to 40 years/ 50 years (For Life, Extra Life, Income & Extra Life Income options) subject to meeting the maximum maturity age. For the Life Long Protection and the 3D Life Long protection, you will be covered for the whole of your life. How long do I pay premiums for? For the 2 whole life cover options namely, Life Long protection and the 3D Life Long protection, the premium paying term would be the difference between 65 & your age at entry or difference between 75 & your age at entry (For Life Long Protection option only). Are You Making The Common Mistake Of Considering Term Plan As An Investment? You might have made excellent investments that are growing well. That said, distant life goals, such as child’s higher education and retirement, need substantial savings accumulated over long periods. Now, if the worst were to happen to you, all your hard work would come to a naught because your family might have to make premature liquidation to make ends meet, be it taking care of the living expenses or meeting obligations such as outstanding loans. This is where a term plan comes in. It provides financial cushion so that your existing investments can run their full course. If you and your family are financially vulnerable, your risk appetite would be low. Your main investment objective would be to remain focused more on preserving capital, and not growth. Hence, you would prefer to invest in conservative products like fixed income investments such as fixed deposits where the returns unlikely grow faster than inflation. On the other hand, if you take a term plan with ample life insurance coverage, you would be assured of your family’s well-being in your absence. This can increase your risk appetite while investing. Equities are known to be volatile in the short- to medium-term, but are considered one of the best asset classes for long-term investment made over 8-10 years or more. This capacity to invest in higher risk, higher return investments, is enhanced by ample coverage from term plans. Given the all round financial security term plans bring, they are far more rewarding than many think. It would be wrong to compare the benefits of a term plan with other investments since its function is completely different i.e. of protection. Since term plans are the least expensive ways of ensuring your family with a high life cover at a nominal cost, it’s prudent to include its premium as an essential expense for the family’s well-being. Now that you have decided to buy a term plan, the next question on your mind will be whether to approach an advisor or buy the plan online all by yourself. We tell you how these two approaches work and which one you should use given the circumstancess. When buying a policy through an advisor, you would typically need just a good reference of an advisor. This is usually from a person whom you trust, and who has had a good experience with the recommended advisor, both in terms of subject knowledge and service quality. Another way of finding an advisor is to do basic research or ask your friends and relatives about how to find the right insurance company. Once you decide the company from which you want to buy your term plan, you can call up their sales team or contact their branch office from where you are assigned an advisor. The advisor works like a consultant who asks many questions to you to learn about your finances and understand your future financial needs. Based on your inputs he can suggest a term plan that’s suited for you. When you decide to buy a term plan online, you will need to figure out the way yourself by going through numerous resources like knowledge websites, expert blogs, forums and online communities, and know about the various products and people’s experiences, as well as understand the process of need analysis. Advisors can be associated with only one life insurance company. Therefore, their recommended products would come out from that company. On the other hand, an online search process, besides helping you find the right insurance amount, will also help you find an appropriate term plan that meets your financial security needs in the best possible manner. Online forums also provide you the platform to interact with many people who had similar experiences and have gone through this self-learning process earlier. Discussion on similar topics available on various blogs and forums also work as a readymade material with which you can quickly relate and move up the learning curve about discovering your insurance needs and the right product. You can also ask questions to subject matter experts on their blogs. You could also find many online product aggregator websites which provide the quickest and easiest way to comprehend the comparison on various product features offered by insurance companies. Besides assisting you on your insurance needs, an advisor could also help you with your overall financial planning. As a one-point contact, most advisors help their clients in regular premium payments, nomination updates, change of address or bank details, and if need arises, help the family with the claim settlement. However, when you have sufficient time and interest to do it yourself, you can get full control of managing your personal finances by buying insurance plans online, among other things. With evolution of alternate channels like customer service on phone or email, you can also have direct communication with the insurance companies. You can get statements and updates over email. You can also get your requests processed through phone, email, or by contacting the nearest branch of the insurance company. When you embrace the advisor model, there are many costs which are built in the price of the term plan bought through the advisor that the insurance company bears in the distribution of the product. Besides the commission from the insurance company, many financial advisors also charge a consultancy fee. On the other hand, if you buy the term plan online, the insurance company saves on the distribution and operational expenses, and hence, passes on the benefit to the customer by way of lower premium charges. We have all heard the saying “stitch in time saves nine” referring to the importance of doing things on time or face the consequences of the delays. The age old wisdom works pretty well when it comes to delays in buying life insurance, especially term plans. Mostly people wait for events like marriage or parenthood to buy a term plan when the need to protect their loved ones dawns on them. However, buying a term plan later in life is more disadvantageous than it may appear. This is to state the obvious. Without a high life insurance coverage term plan you and your family remain exposed during a phase of life when, in your absence, your savings will not be enough for your family to meet regular expenses and future needs. If the worst were to happen, your investments would also have to undergo premature liquidation. This effectively is a huge cost your family will have to pay at a time of great need.If you buy a term plan when young, your premiums are lower compared to buying them later. This is because of lower mortality charge levied by the life insurance company which increases with age. So, more the delay in buying the term plan, higher the premium you will end up paying. On the other hand, if you buy a term plan early on, besides paying a low premium, you enjoy this advantage throughout the term of the plan.If you buy a term plan at early age then most of the medical tests are waived off or are lighter in nature. However, as you get along with the years, medical conditions surface typically from the late 30's to 40s. At this stage, medical tests are comprehensive and in the event of detection of complications, you will need to pay a higher premium. Also, you could be charged a higher premium if you have been suffering from ailments in the period leading up to buying the plan. Postponing the purchase of a term plan leads to certain consequences which few people anticipate. With time you have other financial obligations such as meeting regular obligations like home and car loan EMIs, school education expenses of your children. This means there will be competing demands for your money by many important heads of expenses. The term plan premium payment only adds to the difficulty. As you progress in life, your income and savings go up. It is important that this savings is deployed in investments in progressively increasing amounts to meet all future needs with ease. This process is likely to get disturbed if your finances get stretched thanks to premium obligations. Remember, the life insurance cover needed in later years will keep rising as you are likely to have increasingly higher living expenses and aspire for upgraded goals like foreign education for children, instead of studies in India. Clearly, the cost of a delay in securing your family with a term plan is much more than what meets the eye initially. There is little doubt that you owe to your family the stitch in time especially when it comes to securing them.